Who knew? Or even cares for that matter. Well you might be interested to learn that it's a common source of soda ash, a significant economic commodity because it's used in making glass, chemicals, paper and detergents. Think Gallo wine bottles, since a significant portion of this plant's products are shipped to them in central California, just down the road from me. Well at least all their grapes are grown around my little part of the world. Why would the Golden Spike Railroad Group want to go here? Mostly because it's on the way to Death Valley for their big encampment. However they DO have a railroad here. It doesn't go far, only 31 miles. 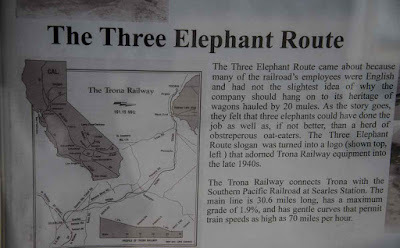 It's called the Three Elephant Route because many of the railroad's employees were English and couldn't understand why anyone would use 20 hay burning mules to haul this stuff to the railroad. They thought three elephants could do just the same with less expense. The name stuck. Finally the railroad was built from Trona to a junction with the Southern Pacific Railroad. They brought in fuel and took out potash, or whatever they were making at the time. 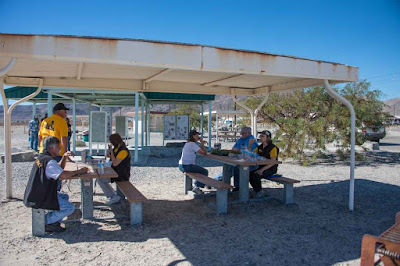 Originally it was borax they were after in the late 1800's around Searles Lake. They scraped it up with mules pulling scrapers. When the borax ran out, they tried other manufacturing processes to make other products. At this time, they are pumping out the salty brine from under the landscape and processing that with an evaporative system. 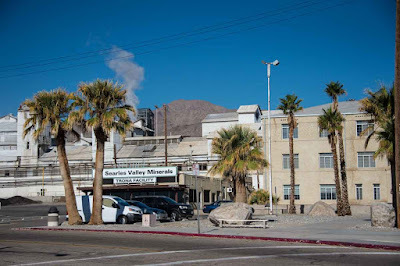 Several companies have owned the property, with American Trona being the first. Over the years it has changed hands, but most of the buildings remain intact. This was the guest quarters, housing several apartments for big names guests of the company. Looking just the same today, it is now the museum that we visited. Do NOT take pictures. Our hostess with the mostest was very adamant about that. Ninety something years old, she has almost single handedly acquired everything in this and several other buildings. It really is a fascinating set up, showing every different owner and telling you what life was like back in the day. She worked for the various companies until her retirement. It took us a full two hours to get through the museum before stopping at the rest stop for lunch. We then returned to the second museum in the Company Housing section. It's fascinating, this little town. 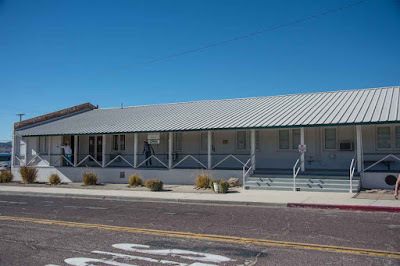 The Mexicans were only allowed to live on the far side of the tracks, with all the upper echelon folks having houses in the company town. Every one is built exactly the same, with huge tin roofs and big front porches. There's way too much stuff for a single post. I'll finish up tomorrow. Today I'm going on that petroglyph hike. Wish me luck ... it's located at over 5000 feet and they promise it to be cold!!! What an interesting place to visit, thanks for that great information and keep having fun there. There are lots of little towns around here, mostly ghost towns. Me me me I know 👋👋👋👋 Francis "Borax" Smith, the "Borax King"
Yes I do ..... wow ... that was a LONG time ago!!! There's a place on one of our local railroads that moved soda ash from rail cars to trucks for delivery to a local paper plant. The plant has a siding, too, so I never quite understood why the transshipping but it sure makes an easily modeled industry. I've seen the plants, but had no idea what they were producing, or why. It's an interesting area, to be sure.